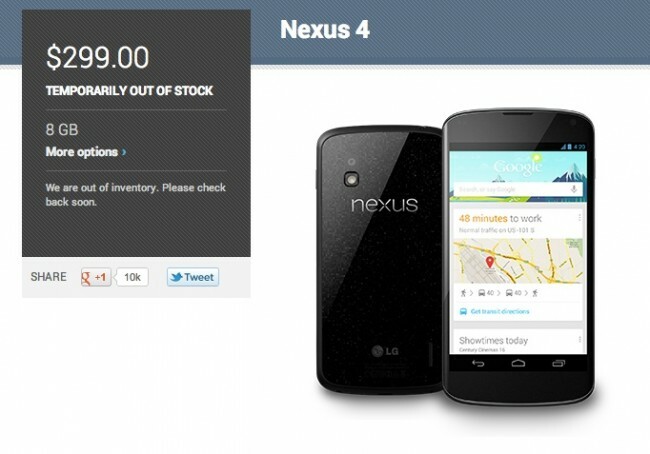 Nexus 4 Changes to “Temporarily Out of Stock” in Google Play Store, Return Imminent? Google’s Nexus 4 has essentially been flagged as “Sold Out” in the Google Play store since back in December. Shortly after its initial launch, it returned for a brief period, but since the device is one heck of a steal for an unlocked phone, and Google and LG are reportedly horrible at predicting demand for their products, we have been counting the days until it became available again. That time could be soon, well maybe. The Google Play pages for the Nexus 4 in both 16GB and 8GB variants, changed from “Sold Out” to “Temporarily Out of Stock” this evening. One could jump to the conclusion that this means we will see stock shortly, or one could just look at this as Google planning for the future. Either way, it’s some sort of a sign, and that’s something we haven’t seen from either page in over a month. With the device arriving in all T-Mobile stores, on T-Mo’s website for a brief period last week, and now on Best Buy’s site, it could be a teaser for what’s to come. And that would be, a return of stock all over the place. You may want to keep an eye on the Play store over the next couple of days. Update: A little birdie just told us that the Nexus 4 could return tomorrow morning at 9AM PST.